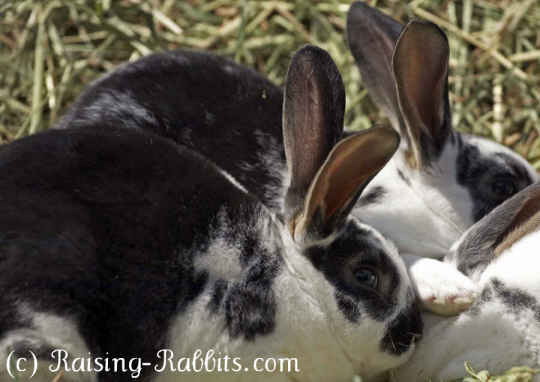 These pictures of rabbits were taken here at Aurora Rex Rabbit Ranch. 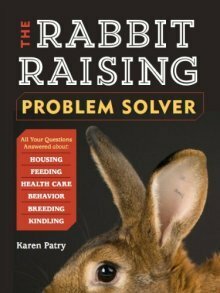 Since we raise only standard rex rabbits, this album is all about rex rabbits. 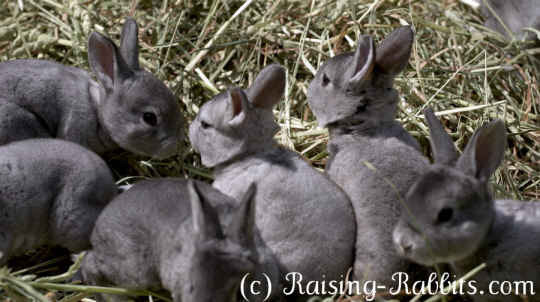 These chinchilla rex rabbits are just youngsters about 4 weeks old. They are not weaned yet. Chinchilla fur is mostly pearl white, with just the ends tipped in black. If you blow into the coat, you'll also see a gray band right next to the skin. Chinchilla is an agouti color, with the yellow pigment stripped away, leaving just the black tips, and the ring that should be reddish, is simply white. The first picture is of a black otter rabbit who is now a champion. She has a typical "commercial" body type. 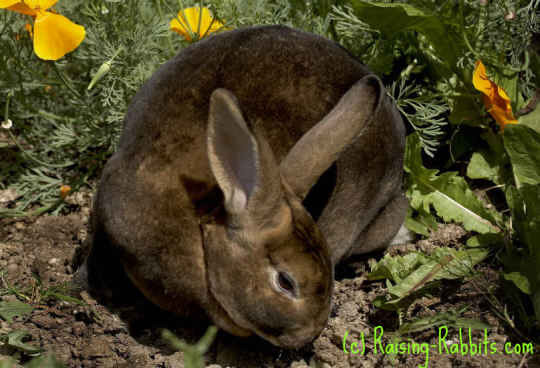 Black otter coloration is dominant over black rabbits, but recessive to agouti rabbits, such as the castor coloration. 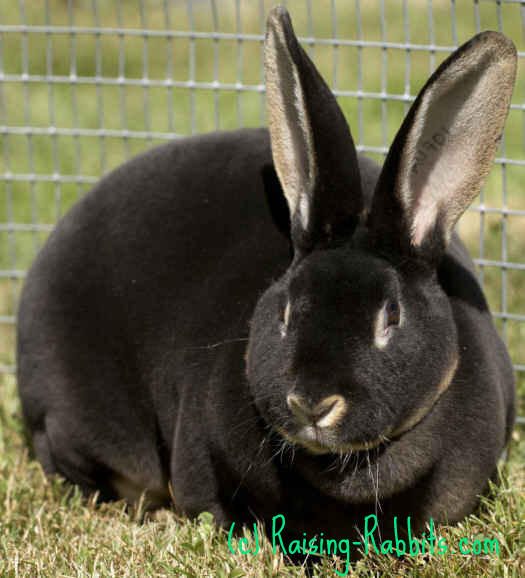 Because the black otter doe is nearly an adult rabbit, she has her prime coat - thick, short and plush. 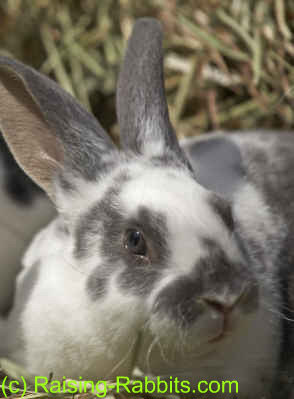 The next two shots are of young, very promising broken otter rex rabbits. The dark rabbits are broken black otters, and the lighter rabbits are broken blue otters. 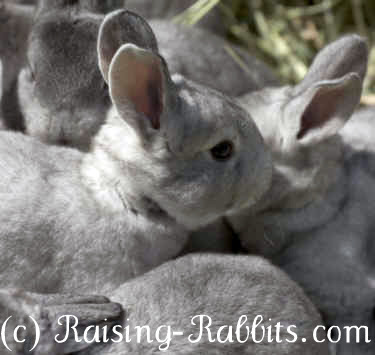 The difference is a recessive 'dilute' gene, that faded the black to a very pretty blue-gray, and the rich tan to a light fawn. The blue otter's eyes are also blue-gray, rather than brown. 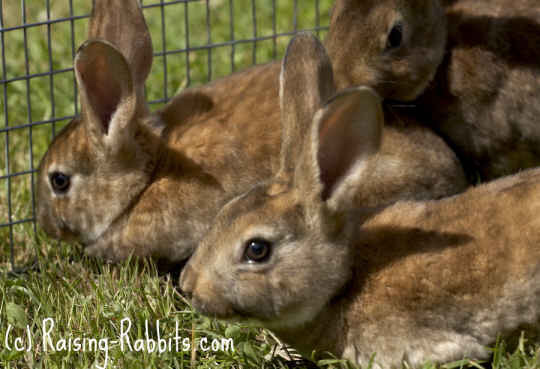 The first two pictures of castor rex rabbits show some 10 week old young rabbits. The third is one of my favorites. 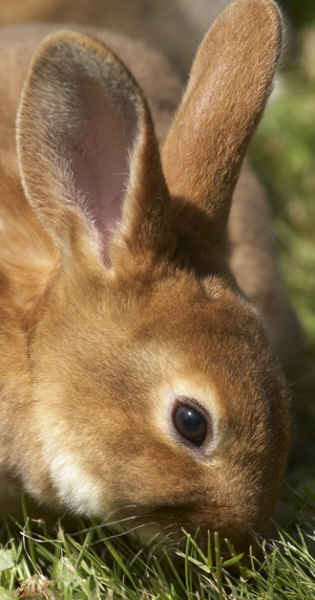 It shows the typical dense plush coat a rex rabbit should have, and the warmth of the rufus red under the black tipping.